In this article, the experts of Mathematics bring to you the most appropriate solution of Rajasthan Board class 12 Mathematics Question Paper 2018. Download the complete solution in PDF format. Solving previous years’ question papers is very important for students to get familiar with the pattern and difficulty level of the board exams. Instead of solving question papers orally, students should solve each problem on a notebook or paper because sometimes on seeing a question we feel that we will be able to do it but while writing during the exam we get struck in between the solution. In this article, students preparing for upcoming board exams will get Rajasthan Board Class 12 Mathematics Solved Question Paper 2018. There are 30 questions with internal choices in 5 questions. 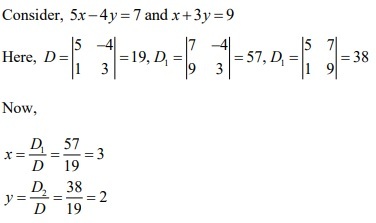 The questions were divided into four sections i.e., A, B and C. There is a very less possibility of getting any error in this solved question paper as it is done by experienced Subject Experts of Mathematics. How to refer this solved question paper? Students must solve the question paper after setting real board exams like conditions. Thereafter, refer the Mathematics Solved Question Paper 2018 to find out where you were wrong. Students must revise the whole concept, if they stuck at the initial steps while solving the question paper. Find the area of the region bounded by the parabolas y2 = 4y and x2 = 4y. Bag A contains 3 red and 4 black balls and Bag B contains 4 red and 5 black balls. One ball transferred from bag A to bag B and then a ball is drawn from bag B. The ball so drawn is found to be red in colour. 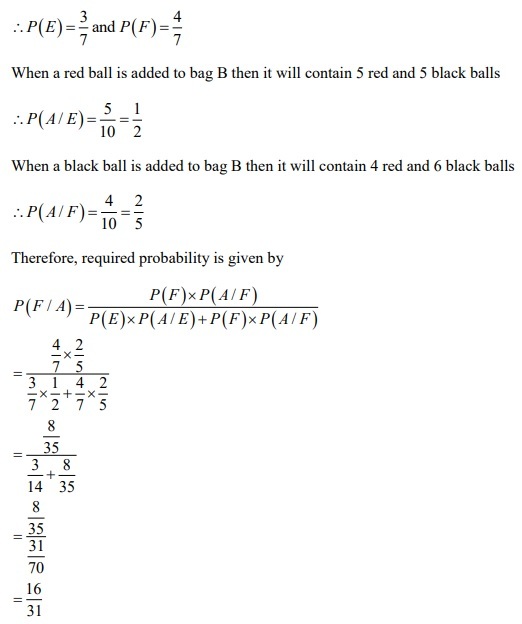 Find the probability that the transferred ball is black. Two cards are drawn successively with replacement from a well-shuffled deck of 52 cards. 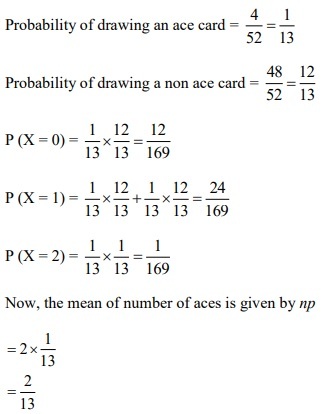 Find the probability distribution and mean of the number of aces. X = number of aces obtained in 2 draws.